Brave badlands explorers have scrounged around Wasteland 2 's, er, wastes since its Early Access beta rode in from the dust last December. After a record-setting Kickstarter campaign , bug-bashing updates , and gradual expansions of playable areas, inXile feels the time is nigh for some post-apocalyptic ranging mixed with a little justice . 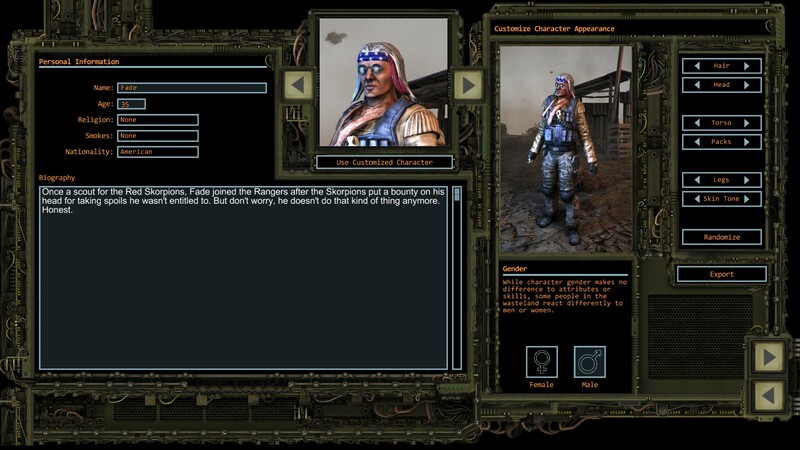 Pin your sheriff's badge on the last weeks of August, because that's when Wasteland 2 launches in full. As director Brian Fargo wrote: "It's exciting to be in this home stretch, and all your support and feedback throughout the process has made the game much better than it would have been otherwise. What we're releasing is a game of much greater scope than we ever dreamed of when starting our Kickstarter. More features, more areas, more reactivity, more words, all thanks to you for funding our game and for giving us the time needed to finish it. My goal has been to over-deliver on your expectations for Wasteland 2." The game's beta also saw a significant update adding the major Arizona area—approximately "half the entire game" is now playable, Fargo said—reworking character creation and HUD screens, adding difficulty levels, and spiffier icons. That's most of the important stuff, but the rest of the mountainous patch notes are up on the official blog . Next up for Fargo's team is keeping up the steady chug of Wasteland 2's development progress marked by the "feature-complete" state of both beta and full versions. That doesn't mean features can't meet the chopping block before August, though. "We're still testing functionality, gameplay balance impact, and even quality," Fargo explained. "If a feature is not good enough, we'll cut it, but if fan feedback and internal review indicates it's vital, we'll double down on it. But the main focus for the new few months lies with balancing, optimizing and of course mercilessly hunting down bugs." InXile doesn't have an exact date for Wasteland 2's August release, but when it does, it'll be out for PC, Mac, and Linux.